^ a b Simpson et al. (2006). “The evolution and diversity of kinetoplastid flagellates”. Trends Parasitol. 22 (4): 168-174. doi:10.1016/j.pt.2006.02.006. ^ Frolov et al. (2017). Eur. J. Protistol. 57: 85-98. doi:10.1016/j.ejop.2016.10.007. ^ Votýpka et al. (2013). “Diversity of Trypanosomatids (Kinetoplastea: Trypanosomatidae) Parasitizing Fleas (Insecta: Siphonaptera) and Description of a New Genus Blechomonas gen. n.”. Protist 164 (6): 763-781. doi:10.1016/j.protis.2013.08.002. ^ Jirků et al. (2012). “New species of insect trypanosomatids from Costa Rica and the proposal for a new subfamily within the Trypanosomatidae”. J. Eukaryot. Microbiol. 59 (6): 537-547. doi:10.1111/j.1550-7408.2012.00636.x. ^ a b c Espinosa et al.. “An appraisal of the taxonomy and nomenclature of trypanosomatids presently classified as Leishmania and Endotrypanum”. Parasitology. doi:10.1017/S0031182016002092. ^ Yurchenko et al. (2016). “Diversity of Trypanosomatids in Cockroaches and the Description of Herpetomonas tarakana sp. n.”. J. Eukaryot. Microbiol. 63 (2): 198-209. doi:10.1111/jeu.12268. ^ Votýpka et al. (2014). “Kentomonas gen. n., a New Genus of Endosymbiont-containing Trypanosomatids of Strigomonadinae subfam. n.”. Protist 165 (6): 825-838. doi:10.1016/j.protis.2014.09.002. ^ Hamilton et al. (2015). “Infection Dynamics and Immune Response in a Newly Described Drosophila-Trypanosomatid Association”. mBio 6 (5): e01356-15. doi:10.1128/mBio.01356-15. ^ Flegontov et al. (2013). “Paratrypanosoma is a novel early-branching trypanosomatid”. Curr. Biol. 23 (18): 1787-1793. doi:10.1016/j.cub.2013.07.045. ^ Svobodová et al. (2007). “Sergeia podlipaevi gen. nov., sp. nov. (Trypanosomatidae, Kinetoplastida), a parasite of biting midges (Ceratopogonidae, Diptera).”. Int. J. Syst. Evol. Microbiol. 57 (2): 423-432. doi:10.1099/ijs.0.64557-0. ^ Kostygov et al. (2014). “Molecular revision of the genus Wallaceina”. Protist 165 (5): 594-604. doi:10.1016/j.protis.2014.07.001. ^ Poinar, G. Jr. and Poinar, R. (2004). 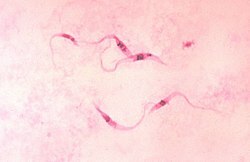 “Paleoleishmania proterus n. gen., n. sp., (Trypanosomatidae: Kinetoplastida) from Cretaceous Burmese amber.”. Protist 155 (3): 305-310. doi:10.1078/1434461041844259.